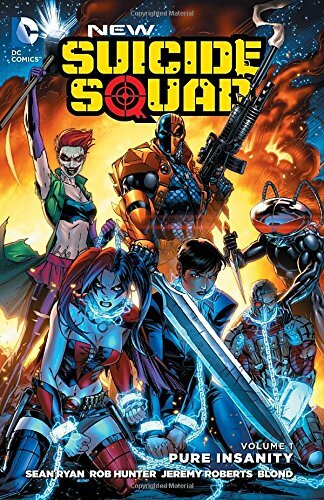 The New Suicide Squad Vol 1: Pure Insanity tells the story of the revamped Suicide Squad of the New 52 featuring the original team members: Black Manta, Harley Quinn, and Deadshot along with two new members Joker’s Daughter and Deathstroke. The graphic novel covers the explanation of the task force and it’s purpose while presenting internal conflicts between not only the team but also those that manage the puppet strings of Suicide Squad. Both Vic Sage and Amanda Waller struggle for dominance and power while Deadshot and Deathstroke fail to caress the ego of the other as both of course feel they are the better assassin. Add to this mix the enraged fury of Harley Quinn for Joker’s Daughter having her ex-lover’s face and you have a tempestuous team. As always Harley is my favorite of the team. I appreciate how the New 52 story threads have introduced her as both insane and logical in only the way Harley Quinn can be. I enjoyed the fact that the writers gave a little nod to her past as a psychologist, as humorous as it was given the circumstances. While there are new members they don’t seem to last very long and go quite quickly and quietly. Joker’s Daughter is there one moment, injured the next, and then off to an undisclosed mental ward. Go figure that one. Needless to say the determined less important characters are just discarded without any explanation of what happens next. Add to this whole insane mix the introduction of Man Bat Ninjas. Yes… ninjas… Reverse Flash, and Captain Boomerang and you got a great explanation of why this collection is called Pure Insanity. Crazy action, insane groupings of folks that are more like foes than team players, and a lot of explosions and you got what you came here for. One story goes and another one comes through when the Suicide Squad is sent off on another mission where Harley Quinn gets red button push happy and unleashes an unknown individual that saves her life. Fancy that. Needless to say the story closes with the team questioning their purpose in life and in general as part of the Suicide Squad. For me being familiar with quite a few of the DC anti-heroes I was not really that well versed in Suicide Squad. Pure Insanity was a great jumping off point into their world. So if you are like me and know the names of the characters, or have a vague familiarity with them and want to know more… this is a fantastic jumping off point. We all know (or should know) that the movie is coming out soon. Does Pure Insanity make me one to eagerly anticipate the movie now? You bet your britches it does! Until next time my bibliophile friends and comic book geeks, happy reading!